I lunched today with two fantastic southbound thru hikers, a couple of folks from the great state of Tennessee. Their blog on www.trailjournals.com is so creative, I just had to meet them. Since Maine, they’ve been living for the day when they’d slide south of the Mason-Dixon line and return to the land of sweet tea, mac and cheese, biscuits and gravy, and almighty grits. We met at my usual spot in Harpers Ferry. The Appalachian Trail Conservancy headquarters is like a temple where thru hikers memorialize their hike with an official photo that is filed in the official data base forever. They can bring their kids back decades later, open the book, and there they are in full glory. There’s even a copy to be found on line, so you don’t actually have to visit. As I drove in, I couldn’t miss them. There they were marching up the hill distinguished by their bright orange pack covers. The international orange pack jackets are supposed to protect hikers from deer hunters figuring no one would ever confuse a deer with a traffic cone – would they? After the obligatory introductions and photo ceremony, we headed out for lunch in the historic district where John Brown’s raid on the arsenal and some anecdotal civil war history happened. We found a eclectic eatery nestled in a house erected in the early 1800s. We settled into a cozy patio carved from the rocky cliff behind the house. Shaded on a hot day, it was nice. The conversation superseded pouring over the menu, so we ordered on the fly. I need to digress a bit. I have lived enough in the south to be an honorary southerner with certain southern culinary habits. I like all of the aforementioned southern delicacies, and often substitute them for haute cuisine. Back to the story. It wasn’t until I ordered sweet tea that my guests fully realized they were back on Confederate territory. 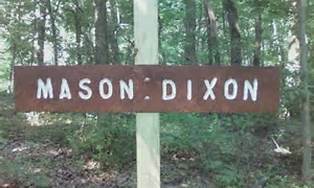 You see, someone has stolen the sign demarking the Mason – Dixon Line. Without that reminder, who knew! A quick check of the menu revealed mac and cheese and most of the other great southern dishes. So, there they were. Hike only half way done, but almost all the way home. Trooper and Number 2, thanks for letting me have a tiny share of your most excellent adventure. Godspeed. I am getting knowledge everyday by reading such good articles.